Listed below is the evolution of the Pittsburgh Penguins logo from their inaugural season in 1967, to their modern day logo. Brière was selected by the Pittsburgh Penguins in the third round (#26 overall) in the 1969 NHL Amateur Draft. During his junior career with the Shawinigan Bruins, Brière scored 129 goals and 191 assists, for 320 points in 100 games. During his only NHL season, Brière would be a core component to the Penguins as they went to the second round of the playoffs in the 1969–70 season. He scored 12 goals and 32 assists, finishing third in team scoring with 44 points. At this time, many scouts were predicting that the slightly-built but fast and nimble Brière would be a top NHL star for years to come. Brière was even being compared to the likes of Phil Esposito and Bobby Clarke, who were also young phenoms. Brière returned to Quebec to marry his childhood sweetheart Michele Beaudoin. Brière and Beaudoin, who had a year-old son, Martin, were to be married on June 6, 1970. On May 15, 1970, Brière was involved in a single-car crash with two friends. Brière was ejected from his orange 1970 Mercury Cougar along Highway 117 in Val-d'Or, 70 miles from his hometown of Malartic. Briere suffered major head trauma, and was flown 300 miles by government plane to Notre Dame Hospital in Montreal, where Dr. Claude Bertrand, a leading Canadian neurosurgeon, performed the first of four brain surgeries. Bertrand delivered his prognosis that Brière had a 50-50 chance of living. 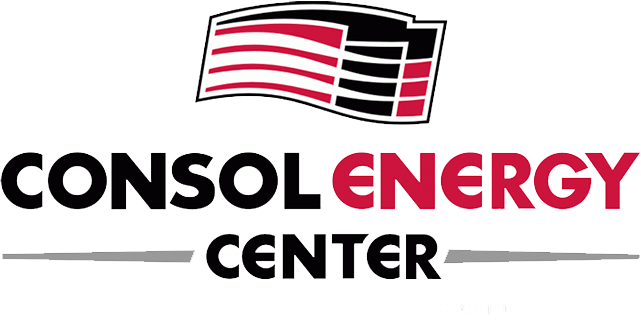 While Brière was hospitalized, the Penguins started pre-season conditioning near Brantford, Ontario. Then-trainer Ken Carson added Brière's name to the back of a jersey, which, along with Brière's equipment bag, traveled with the team for the 1970–71 season. Ten months later, Brière was transferred to Montreal's Marie-Clarac Rehabilitation Hospital on March 27, 1971. The Penguins finished the regular season at home on April 4 – a 1-1 tie with St. Louis – and missed the playoffs. Nine days later, after 11 months in a coma, Brière died at 4:20 p.m. Six members of the Penguins, including Jack Riley, Carson and coach Red Kelly, attended the funeral outside Montreal. A memorial service was held in St. Paul Cathedral in Pittsburgh, which most of the team officials and some players attended. Lemieux led Pittsburgh to two consecutive Stanley Cups in 1991 and 1992. Under his ownership, the Penguins won a third Cup in 2009. He is the only person to have his name on the Cup as both a player and an owner. Lemieux's career was plagued by health problems that limited him to 915 of a possible 1,428 NHL games. His numerous ailments included spinal disc herniation, Hodgkin's lymphoma, chronic tendinitis of a hip-flexor muscle, and chronic back pain so severe that other people had to tie his skates. He retired two different times over the course of his career due to these health issues: first in 1997 after battling lymphoma (he returned in 2000), and for a second and final time in 2006, after being diagnosed with an atrial fibrillation. He also missed the entire 1994-95 season due to Hodgkin's lymphoma. Dispite his lengthy absences from the game, his play remained at a high level upon his return to the ice; he won the Hart Trophy and scoring title in 1995–96 after sitting out the entire previous season, and he was a finalist for the Hart when he made his comeback in 2000. The Hockey Hall of Fame inducted Lemieux immediately after his first retirement in 1997, waiving the normal three-year waiting period; upon his return in 2000, he became the third Hall of Famer (after Gordie Howe and Guy Lafleur) to play after being inducted. Many speculate that if Lemieux had not suffered so many issues with his health, his on-ice achievements would have been much greater. Listed below are patches that have been worn on Penguins jerseys throughout the history of the franchise, as well as a description of where the patch was positioned on the jersey, and the significance of the patch. Some information has been cross-referenced from various websites. This patch was worn on the left shoulder of the Penguins uniforms during the 1989-90 season to commemorate the 41st NHL All-Star game. The game was played on January 21st 1990 at the Civic Arena in Pittsburgh, PA. Captain Mario Lemieux was named the games MVP with a 4 goal performance. During the 1990-91 season, the Penguins reached the Stanley Cup Finals for the first time in franchise history. They would not disappoint during their run. The penguins swept the Minnesota North Stars to capture their first Stanley Cup in team history. This patch was sewn to the upper right chest of the jersey. The Pittsburgh Penguins first wore this patch a day after Head Coach Bob Johnson died. Johnson, who joined the team 17 months earlier, lead the Pens to the franchise's first Stanley Cup Championship. The Pens wore the Badger patch on the left shoulder. During the 1991-92 season, the Pittsburgh Penguins wore this patch on the upper right chest when they reached the Stanley Cup Finals against the Chicago Blackhawks. 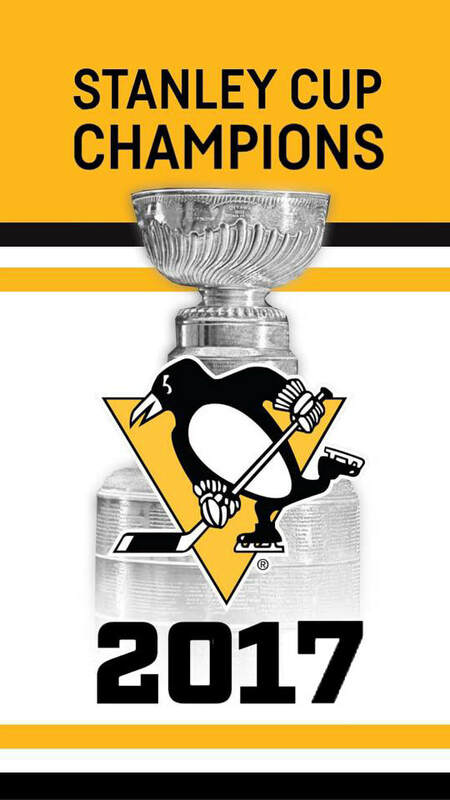 The Pens would come out victorious once again, to capture their 2nd Stanley Cup in as many years. The Stanley Cup patch was sewn on a separate piece of material and covered over NHL's 75 Anniversary patch. In 1991-92 the Pittsburgh Penguins used this patch to celebrate the team's 25th season in the league. It was worn on the right shoulder. The patch design was inspired by the NHL's 75th Anniversary patch which was worn on the right chest. During the 1991-92 season, the Pittsburgh Penguins wore this patch to celebrate the NHL's 75th season. It was worn on the right chest. The patch design inspired the Penguins's 25th Anniversary patch, which was worn on the right shoulder. 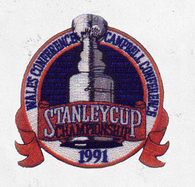 When the Penguins reached the Stanley Cup Finals, the 75th logo was covered over by the 1992 Stanley Cup Finals Patch. The NHL celebrated the 100th Anniversary of the Stanley Cup by having teams wear this patch on the upper right chest on most of the team's jerseys. 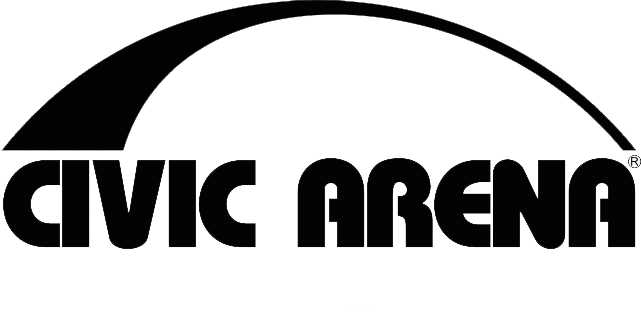 The Pittsburgh Penguins only wore the patch on their new home jerseys, as the road jerseys diagonally spelled "PITTSBURGH", left little room for a patch. During the 1999-00 season, the NHL welcomed the new millennium by having all teams wear the 2000 NHL patch on their upper right chests on both home and away jerseys. The patch color varied based on the teams colors. The NHL opened the 2000-01 season in Tokyo, Japan with the Pittsburgh Penguins playing a two-game series against the Nashville Predators. Pittsburgh wore the patch on both a home and road style jersey on the on upper right chest. The NHL's Hockey Fights Cancer Auction included game jerseys with the patch worn by team captains during January 19-21, 2001. Team captains wore the patch on the upper chest opposite the captain's C. This patch was worn in 01', 02', 04', and again in 08'. On October 8 2005, for the first period of Pittsburgh's home opener against the Boston Bruins, players wore jerseys bearing a special patch on the upper right chest, confirming the club and player's commitment to the people and communities impacted by Hurricane Katrina. The jerseys would later be auctioned off, with all proceeds going to the victims of hurricane Katrina. The National Hockey League and the National Hockey League Players' Association conducted a unique auction of game-worn jerseys with proceeds benefiting the Garth Brooks Teammates for Kids Foundation. Pittsburgh wore the jerseys at home on January 7th 2007 against Tampa Bay. Penguins jerseys raised over $37,000 for the auction. The patch was worn on the upper right chest of the jersey. During the 2007-08 season, the Penguins wore a commemorative 250th anniversary patch for the city of Pittsburgh. Originally the patch was placed on the right shoulder of the jersey. After getting some kickback from the league about the team not filing for a shoulder patch, the patches were repositioned further down the sleeve just above the sleeve numbers. The Buffalo Sabres and Pittsburgh Penguins squared off in the NHL's second-ever outdoor game, and first Winter Classic, on January 1st 2008 at Ralph Wilson Stadium in Buffalo New York. 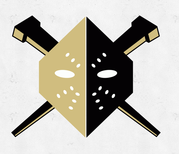 The Penguins wore this patch on their "retro style" uniforms on the upper right chest. The Pittsburgh Penguins wore this patch on the upper right chest area in the 2008 Stanley Cup final facing off against Detroit Red Wings. This would be the Penguins first losing effort in a Stanley Cup Finals appearance. The Pittsburgh Penguins wore this patch on the upper right chest area in the 2008 Bridgestone NHL Premiere when they faced the Ottawa Senators in Stockholm, Sweden on October 4-5th. The Pittsburgh Penguins wore this patch on the upper right chest area in the 2009 Stanley Cup Final against the Detroit Red Wings. This was a rematch of the previous years Stanley Cup Final, only this time, the Penguins would get their revenge and capture the franchises 3rd Stanley Cup. In celebration of the grand opening of the state-of-the-art arena, the Penguins wore a commemorative patch on their jerseys on the right sleeve above the numbers. There was a similar patch made for their alternate blue uniforms that had a blue tint to the patch. During the 2010-11 season, the Penguins participated in their 2nd Winter Classic, this time playing host. The Penguins wore this patch on their new "retro style" Winter Classic jerseys. The Capitals would skate away victorious on the cold rainy night. The Penguins and Capitals, in a joint effort to raise money for the families of Lokomotiv Yaroslavl, the KHL team that perished in a plane crash Sept. 7 in Russia. wore jerseys with commemorative Lokomotiv patches on Oct. 13th 2011. The patch was worn on the upper right chest area. The Pittsburgh Penguins wore their road jerseys with this patch on Saturday, April 20, 2013. The patch features the Boston skyline and “617″ – the city’s area code – were worn to support those affected by the tragedy at the Boston Marathon. The patch was worn on the upper right chest area. On November 14th 2014, the Toronto Maple Leafs hosted the Pittsburgh Penguins for the annual Hall of Fame Game. 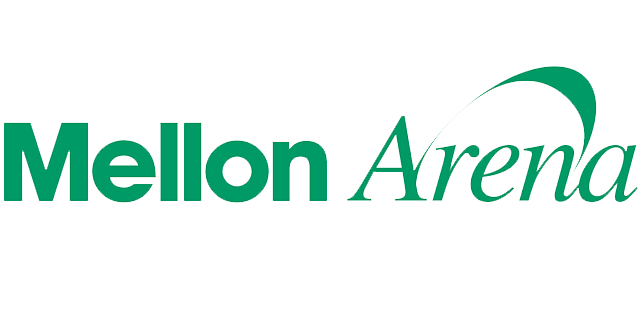 The 2014 inductees included Peter Forsberg, Dominik Hasek, Rob Blake, Mike Modano, coach Pat Burns, and referee Bill McCreary. The Penguins and Leafs wore this patch on the upper right breast of the jersey. The Pittsburgh Penguins wore this patch on the upper right chest area in the 2016 Stanley Cup Final against the San Jose Sharks. This was the last season of the "Vegas gold" jerseys. The Penguins adopted their "Pittsburgh gold" third jersey as their home jersey throughout the playoffs. The Penguins defeated the sharks 4-2 in the series to capture their 4th Stanley Cup title. 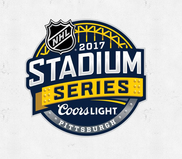 The Pittsburgh Penguins took part in the franchises 4th outdoor game during the 2016-17 NHL regular season. The Pens faced off against their cross state rivals, the Philadelphia Flyers in the 2017 Stadium Series game held at Heinz Field in Pittsburgh, PA. The 2011 NHL Winter Classic was previously held at Heinz Field. The Washington Capitals skated away with a 3-1 victory over the Penguins. The Penguins skated to a 4-2 victory on Feburay 25, 2017. This patch was affixed to both the Penguins and Flyers jerseys to commemorate the event. 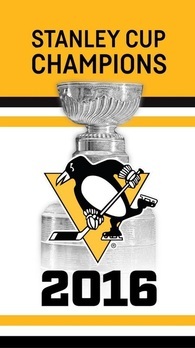 The Pittsburgh Penguins wore this 2017 Stanley Cup Finals patch on the upper right chest area during the finals. The Penguins 50th Anniversary patch was moved to the left shoulder. The jersey also featured the NHL Centennial patch on the lower right sleeve just under the sleeve numbers. The Penguins defeated the Nashville Predators in six games to capture the franchise's fifth Stanley Cup title. The Pittsburgh Penguins face off against the Philadelphia Flyers on February 25th, in a rematch of the 2017 Stadium Series game played in Pittsburgh, PA. This patch was worn on the right shoulder of the jersey. The Penguins fell to the Flyers in overtime by a score of 4-3. During the 2013-14 season, the NHL hosted 4 additional outdoor games known as the "Stadium Series." Three cities hosted the four games. Pittsburgh played at Soldier Field in Chicago Il. The Pens fell 5-1 to the Blackhawks. This patch was worn on the right shoulder of their Stadium Series jerseys. On March 17, 2016 the Pittsburgh Penguins took to the ice wearing their alternate third jerseys with a special patch affixed to the jersey. This patch pictured commemorates the 200th anniversary of the city of Pittsburgh, founded in 1816. The Penguins went on to win the game 4-2 against the visiting Carolina Hurricanes. These one game wonder jersey's were auctioned off to support a local charity. This patch was featured on the Penguins uniforms for the 2016-17 season to commemorate the Pittsburgh Penguins 50th Anniversary season. During the regular season, this patch was placed on the upper right chest. During the Stanley Cup Finals, the patch was moved to the left shoulder to accommodate the Stanley Cup Finals patch. 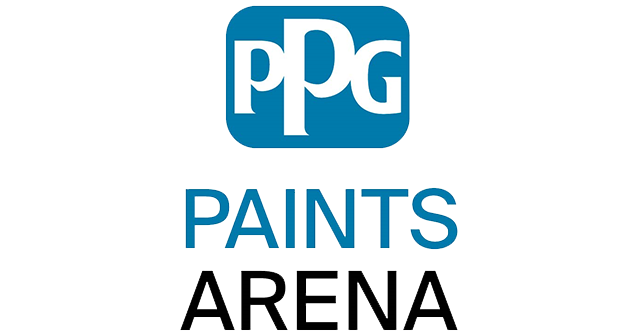 The Pittsburgh Penguins were part of the original expansion in 1967 that added 6 more teams into the National Hockey League. All 30 NHL teams wore this patch on their right sleeve From January 1st, 2016 through December 16th, 2017 to commemorate the 100th year anniversary of the National Hockey League. Due to the various team jersey designs, the league chose the right sleeve for the placement of the patch. The patch was to be worn beneath the sleeve numbers, however, a few teams chose to place the patch above the numbers. ​On October 27, 2018, an armed gunman entered a synagogue in Pittsburgh and opened fire. The gunman killed eleven people and injured sixteen more. The Pittsburgh Penguins wore a commemorative patch to honor the victims of this horrific tragedy. Proceeds from the auctioned set of jerseys were donated to the victim's and their families. This patch was worn on the right shoulder of the home uniform.